Situated in downtown St. Catharines amongst the lively economic businesses and entertainment venues, lies a cozy boutique with an interesting back story of the irreplaceable bond between a mother and a daughter. Lousje & Bean is a women’s clothing shop selling fashions inspired by modern European trends. Lous Oort and her daughter, Tessa, are two passionate clothing designers who seek to reveal the best of women’s beauty and self-esteem through fashion. The company proudly offers Canadian-made clothing and accessories using all-natural materials within their fabrics. Lous was born in Amsterdam and immigrated to Canada in 1969, settling with her husband in Grimsby. “When I first came to Canada, I must admit, the fashion was brutal!” jokes Lous. It was, however, the lack of options for European-style fashions which made Lous successful as an entrepreneur when she opened her first boutique, Pierrot, in Port Dalhousie. Women from all over Niagara came to the unique shop seeking Lous’ expert opinion on the trendiest fashions from across the Atlantic. Pierrot was operated by Lous for seven years before she settled down to start a family and become a full time Mom. Tessa is the youngest and only daughter of four children. Her mother was thrilled at the birth of her baby girl, as she finally had her own little model to dress up and breathe life into the designs she created. Lous would always receive compliments from the other mothers at school who eagerly anticipated the unveiling of Tessa’s new outfits. Together, Lous and Tessa would design all of her dolls’ outfits, and loved to make unique household fabric such as tye-dye curtains. When Tessa was 23, she decided to spend a year abroad in Holland working as a nanny called an “Au Pair”. Inspired by European culture and especially the fashions, Tessa returned to Canada to follow in her mother’s footsteps and pursue fashion design as a career. The current boutique was opened shortly after her completion of the Fashion Design program at George Brown College in Toronto. Unlike Tessa who developed her passion from her Mom, Lous’ skills in fashion were entirely self-taught, as she admits that her own mother couldn’t even sew on a button! The love of clothing design continues to be passed down through the generations, as Tessa’s six-year old daughter, Ruby, has taken an interest in the art as well. Ruby accompanies her mother to the boutique on Saturdays, and once a month they will design and produce a beautiful new dress for her. 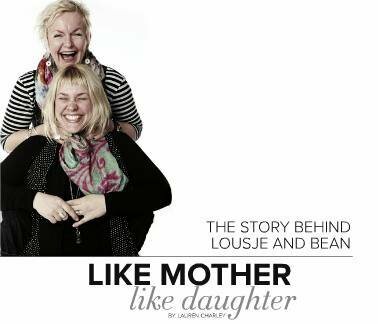 Women often take to the story behind Lousje & Bean because it represents a special bond between a mother and daughter who have worked together to build what is now a successful Canadian fashion line. Both Tessa and Lous even have matching blue butterfly tattoos on their wrists, which is also the recognizable logo for their boutique. Customers who visit this charming boutique must wonder where exactly the name “lousje & bean” came from. “Lousje” is the name of lous plus “Je”, which the dutch refer to as “little one” her nickname as a child. Also derived from her childhood pet name, “bean” is short for“Sabina”, which is Tessa’s middle name. During her frequent trips back to Amsterdam, Lous gains inspiration for their Dutch-influenced clothing in the upcoming seasons, simply by sitting at a café and observing women’s outfits as they walk past. Although their fashions are very much European, Lousje & Bean is proud to design and manufacture all their products within Canada. In addition to their own line, the boutique also carries clothing by other Canadian designers such as “Second Skin Yoga Jeans” from Montreal, and fashions by Susan Harris in Toronto. The clothes are made from all natural materials including linen, bamboo, cotton, and a unique fabric called “viscose”, which is derived from a plant and is popular in European fashions. Participating in fashion expositions is a major part of Lousje & Bean’s business, as they travel to roughly 18 shows across the country each year. They are also dedicated to providing charitable donations to causes in the community by generously giving certificates for upcoming fundraisers, especially those who support women in need. Every year, the boutique partners with The Boot Shop to host an event called “Shop, Save and Giveback”, where both stores offer generous discounts to customers and donate a percentage of the profits to the YWCA. This year, the promotion is scheduled to take place on Saturday December 13th.